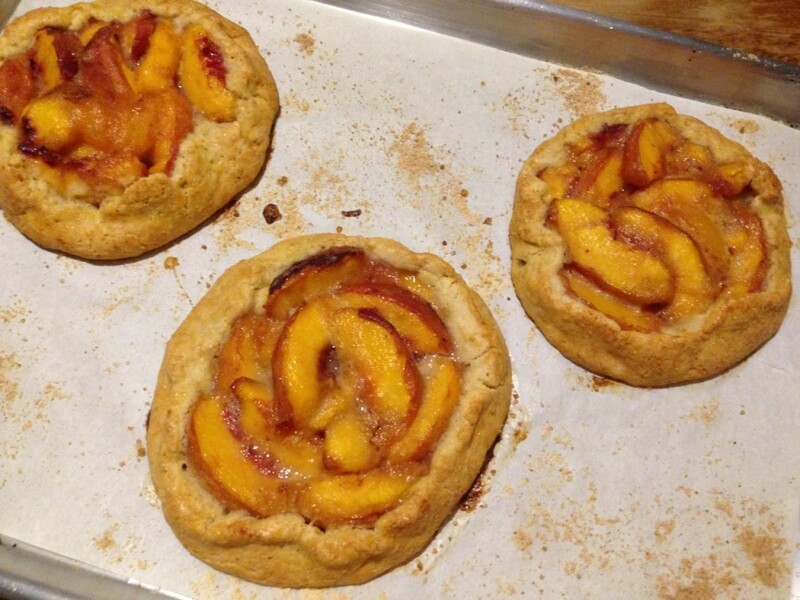 I made this peach crostata recipe last night, served warm, for movie night with the family. 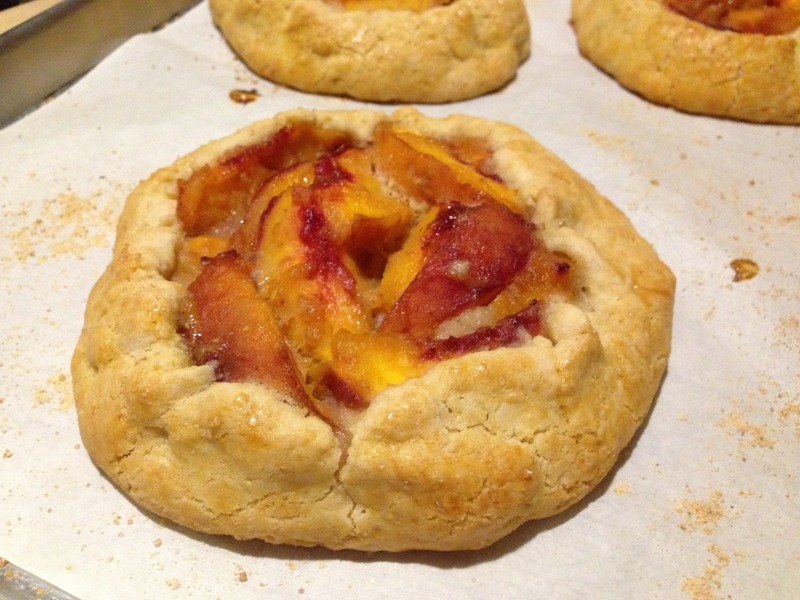 Forget the popcorn when you can have peach crostata. What is a crostata you ask? It’s the Italian word for a free-form pastry crust (sweet or savory) with a filling exposed, and essentially the same thing as a galette, in French. 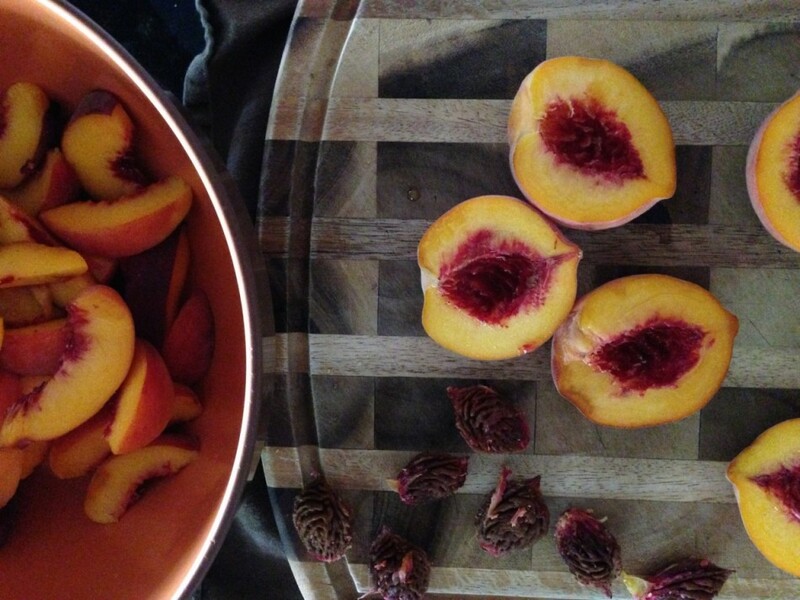 With all the sweet peaches at the farmer’s market, I couldn’t resist a basketful. As much as I love to eat a fresh peach, there is something so comforting about desserts with fruit. Peaches are one of those fruits that can go so well in many recipes – bbq sauces, pancakes, salads, and of course, desserts. A little lemon zest in the dough gives such a nice flavor to the crust and makes it taste less sweet than most doughs. The egg in the dough gives it a buttery-like crust. I made individual portions this time. A little more work but everyone feels extra special when they get their own pretty dessert, don’t you think? Go get some of those delicious peaches before the season is over and try this. Let me know what you think! Happy summer…enjoy! 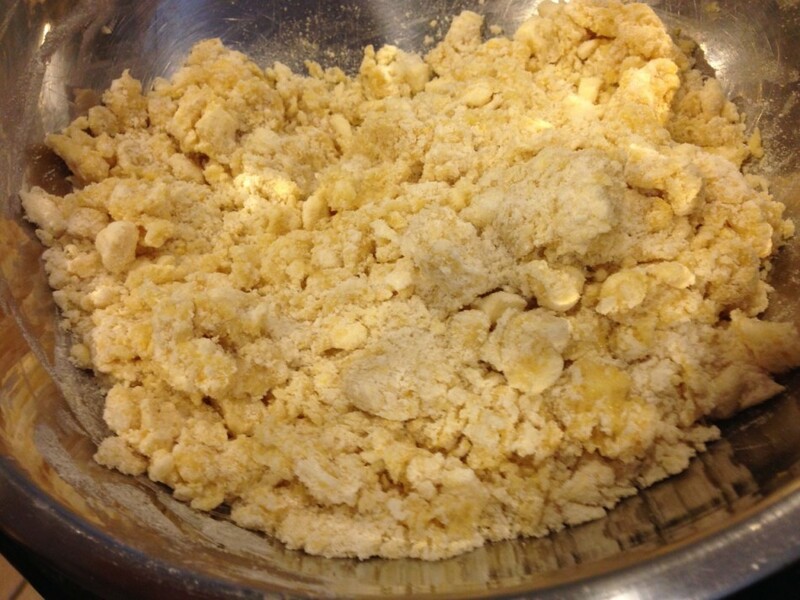 In a large bowl, combine 2 3/4 cups gf flour (2 tbsp is for later), 1/2 cup sugar, baking powder, kosher salt, and lemon zest. Stir to mix well. Using a pastry blender, or your finger tips, incorporating the cubed non-dairy butter into the dry blend until the mixture becomes crumbly. There should be large coarse crumbs formed, the size of peas. In a small bowl, whisk the 2 eggs, and egg yolk with the vanilla extract, then add to the flour mixture and mix until the dough comes together. 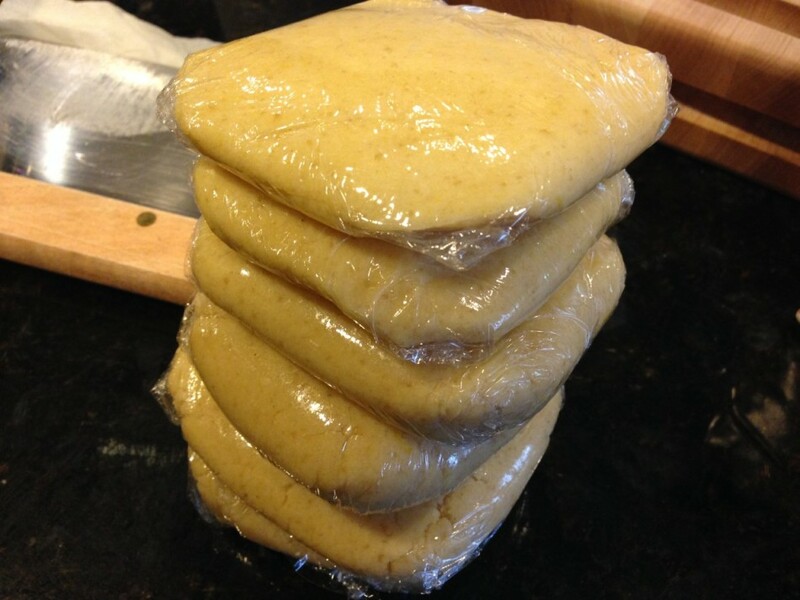 Divide the dough into 6 and wrap each in plastic wrap individually. Refrigerate for at least 30 minutes, or up to 2 days if making in advance. 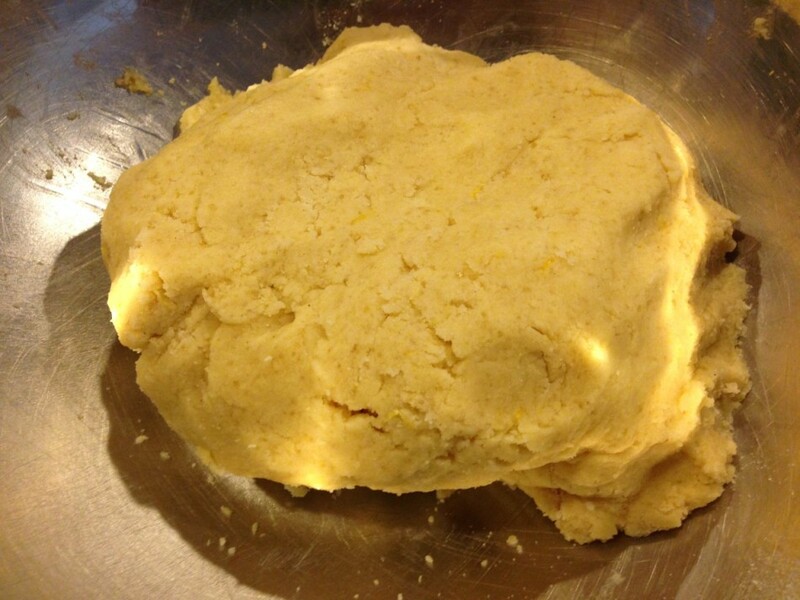 If you want to make 2 large round, divide the dough in two and double the baking time, or until golden brown. Prepare 2 baking sheets (1/2 sheet size pans) lined with parchment paper, sprinkle a dusting of corn or rice flour. Set aside. Slice the peaches, then add all the sliced peaches into a large bowl. Add 2 tbsp gf flour, and the remaining 1/2 cup sugar. Toss to combine well making sure all the peaches are coated. Set aside. 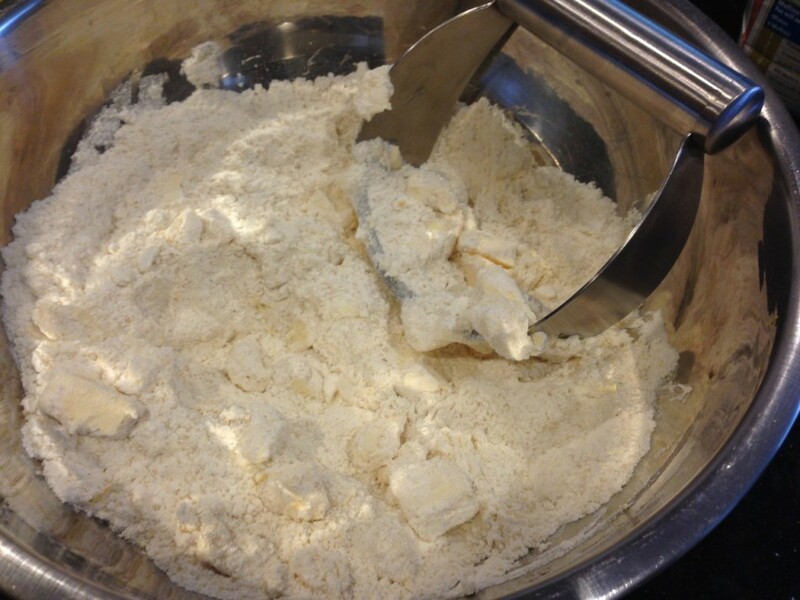 For the egg wash: Combine egg white and coconut milk in a small bowl, mix with a fork until combined. Set aside with your pastry brush. Note: preheat the oven just before you are ready to take your dough out of the refrigerator for rolling. The oven should be ready by the time rolling and filling crostata has been completed. Cut 2 pieces of wax paper, large enough for your work surface. Place one on a cutting board or smooth counter then lightly flour your work surface. Place the dough and cover with the second piece of wax paper. Roll until a 1/4 inch thin and about 6 inches round. Note: I use wax paper because it prevents sticking where parchment will. Gluten free dough can get sticky and fall apart, which is also why I roll it between wax paper. 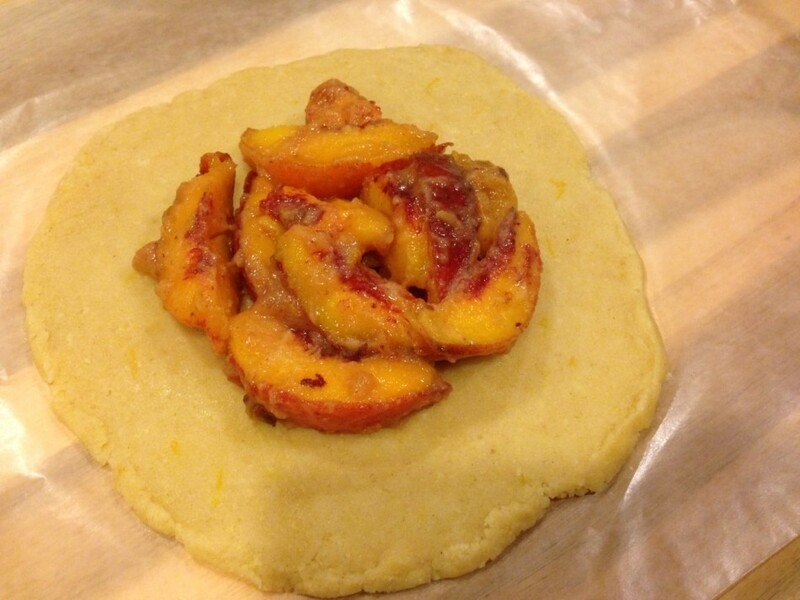 Scoop up about 1/3 cup full of the coated peaches and place in the middle of the dough. Make sure to leave at least an inch around the dough. 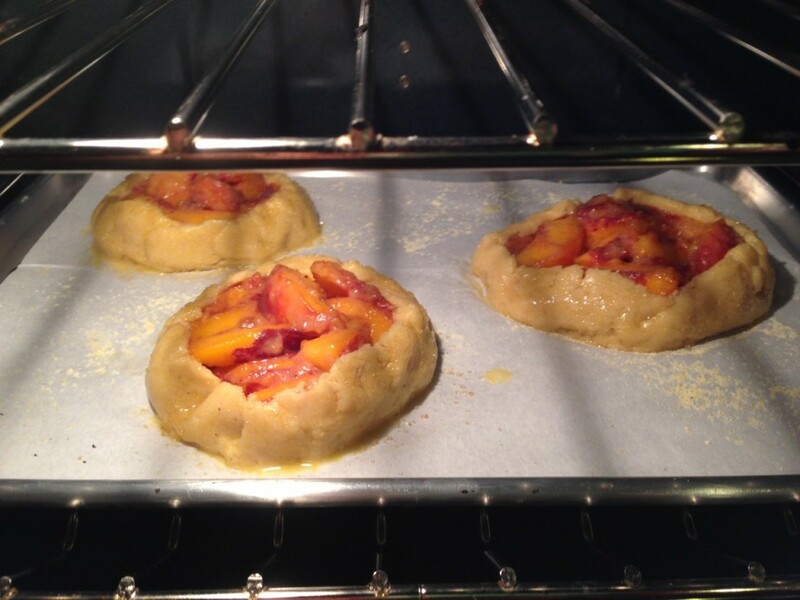 Gently fold up the dough to wrap over the edges of the fruit. I use my handy-dandy pizza spatula (below) to lift and transfer onto the baking sheet. It helps to prevent the dough from falling apart. 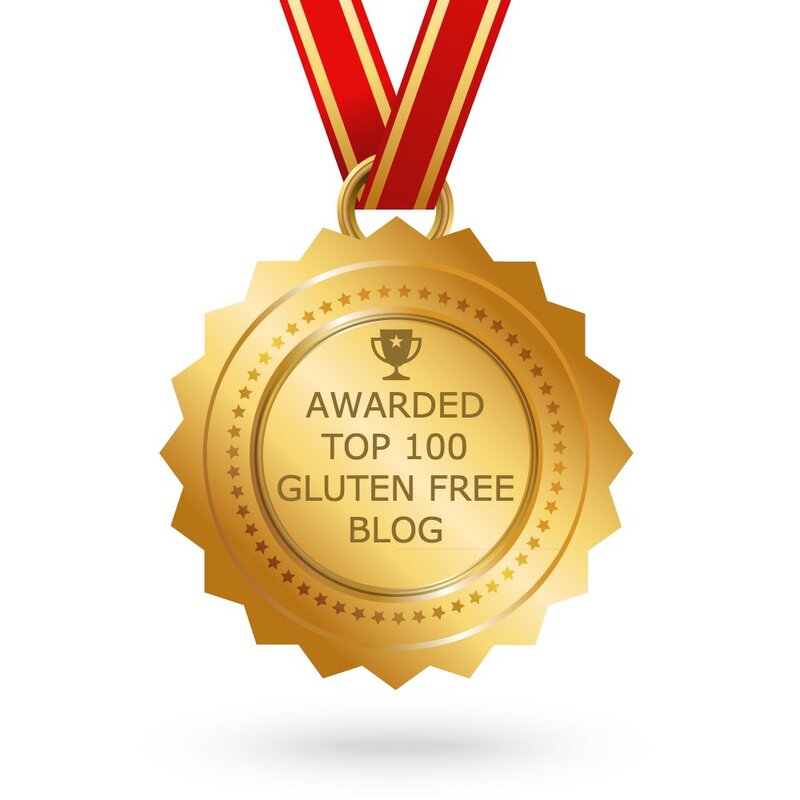 Remember gluten free dough doesn’t have any glue to hold it together! Pun intended Because I rarely ever use xanthan or guar gum in my flour blends it can break apart. After each crostata is prepared brush dough with the egg wash, then sprinkle evenly all over the crostata with turbinado sugar. Using a wide spatula, transfer to the prepared baking sheet. Nothing needs to be perfect here. This is a rustic, happy-to-be-home kind of dessert. Just make sure there are no cracks along the sides or bottom so that the juices don’t run through. Bake for 25-27 minutes, or until the dough is a golden brown and the fruit is sizzling. Let it cool for 15 minutes before serving. Served warm or room temperature. Thank you for the instructional photos, for someone like me who doesn't bake much it's so helpful. I made these today and followed along with terrific results. My dough was tender and flaky! Great recipe! 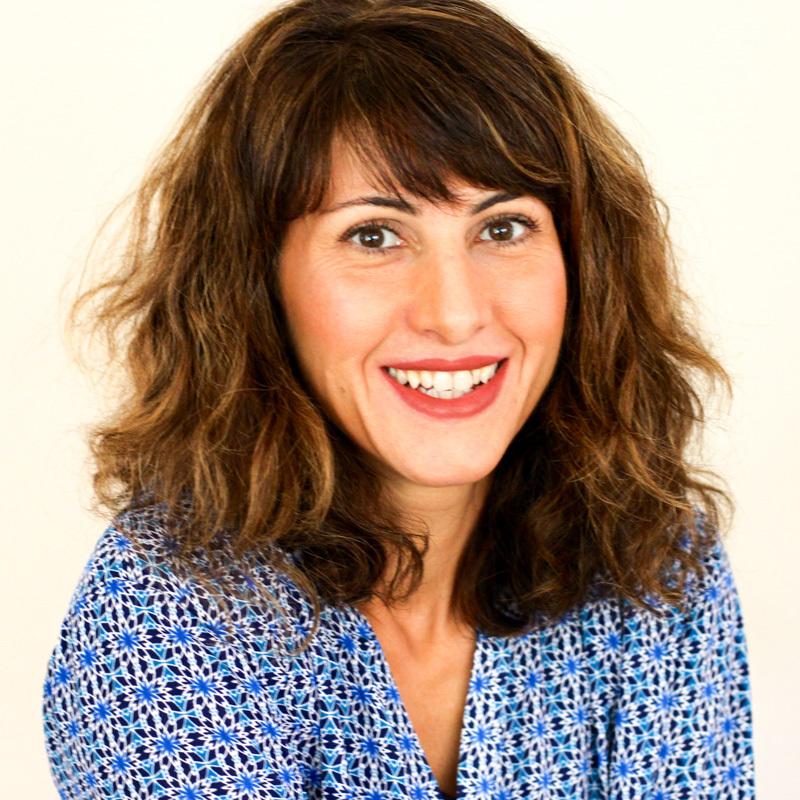 hi!, could you please tell me an approximate time (including baking and resting), as i would like to use this recipe for a food tech assessment but we only have 1.5 hrs.